The revolutionary new rolling cleaner that attracts dirt like a magnet! 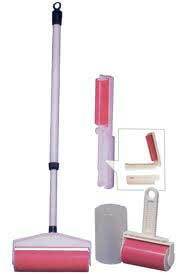 Stick-It instantly picks up lint, dust, pet hair, dirt, sand and much more. Use Stick-It to clean furniture, clothes, floors, car upholstery, walls and even draperies. When you're through, just rinse, let dry and you're ready to clean again!